One of Canada's leading airlines, Air Transat, is celebrating this week after being named as the World's Best Leisure Airline during the Skytrax World Airline Awards in London. Jean-François Lemay, President-General Manager of Air Transat, was on hand in London to accept the award at the official ceremony. "Being singled out as the World's Best Leisure Airline is an honour we're extremely proud of, since it was awarded by our passengers," says Jean-François Lemay. "This honour extends to all of our employees, whose commitment, quality service and hard work ensure our passengers a pleasant, memorable experience, so their vacation truly begins the moment they set foot on board. 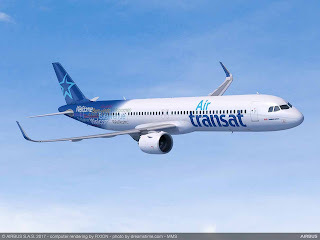 Air Transat takes great pride in having been ranked among the best leisure airlines for seven years running, and to have topped the list for the second time in its history. Once again, I am deeply grateful to our passengers for their trust." Every year, some 20 million travellers from around the world pick the winners by taking part in the largest airline passenger satisfaction survey, a global benchmark of airline excellence. The awards began in 1999 when Skytrax launched its first global airline passenger satisfaction survey. These days the survey covers 320 airlines in 105 countries. The survey runs for 10-months where airlines are marked in over 50 areas, including check-in, boarding, quality of service, seat comfort and many others.